Leader in storage capacity for frozen products in Spain. 538.000 m3 of total storage capacity. Stronghold in north-central regions of Spain. Leader in service of quality. Accredited Quality Certification: ISO 9001. 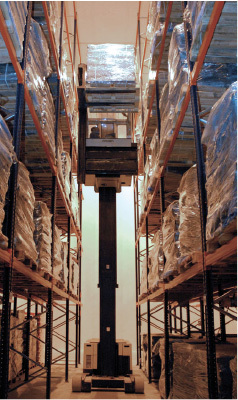 Flexibility: picking, cross docking, freezing, manipulation. Customer satisfaction: response times, loading and unliading times, loyalty rating, failure rating. Information for online customers: traceability of stocks. Economies of scale for size and experience. Services focused on optimizing processes and cost. CAPACITY. The largest network of self owned facilities. LOCATIONS. Central geostrategic corridor platforms, near to factories, with access to motorways. QUALITY OF FACILITIES. ISO 9001 Certifications, minimal thermal fluctuation and optimal relative humidity. QUALITY SERVICE Flexibility, satisfaction, time management. LEADERSHIP IN COSTS. Size, processes, amortization. INTEGRATED LOGISTICS. Integrated logistics operators with strategic alliances with specialists in refrigerated transport. PERSONALIZED MANAGEMENT. Plans tailored to customer´s needs.